Lest we forget all the innocent men, women, and children who were killed in senseless wars of imperialist plunder, and the working men and women who struggled and lost their lives fighting for such elementary rights as union recognition, unemployment insurance, the 8-hour work day, a minimum wage, a safe working environment, and the right to vote, which not all age eligible Canadians had until 1960, over 90 years after Confederation. Don’t let this Remembrance Day be about glorifying state-sponsored terrorism overseas. 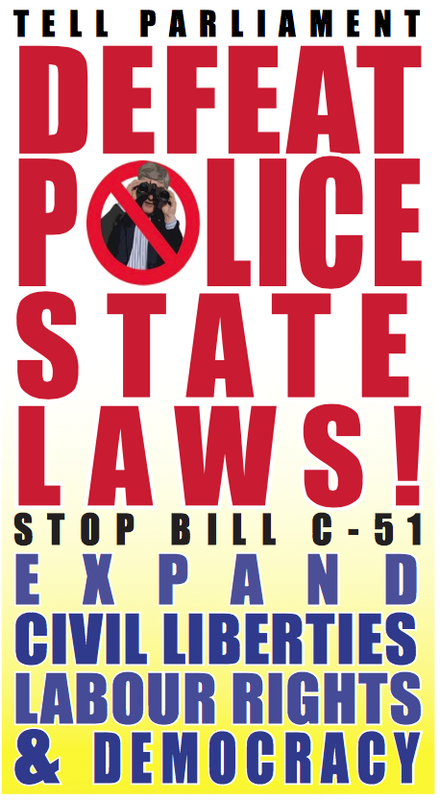 The Communist Party of Canada is campaigning to mobilize visible resistance against Bill C-51, the “Anti-Terrorism Act, 2015” announced in late January. A growing chorus of voices demand Bill C-51 be rejected by Parliament. This is possibly the most serious attack on democratic rights since the War Measures Act. CSIS itself should be dismantled, not expanded. Join us in this struggle! Yemen faces “civil war and disintegration” in the wake of the overthrow of the US-backed government by a Houthi insurgency, United Nations Secretary General Ban Ki Moon declared Thursday. “Yemen is collapsing before our eyes. We cannot stand by and watch. The current instability is creating conditions which are conducive to a reemergence of Al Qaeda in the Arabian Peninsula (AQAP),” Moon said. The comments from Moon come in the aftermath of moves by the Houthis to take over the presidential palace last week, formally dissolving the US-backed regime of Abd-Rabbu Mansour Hadi. The Houthis have simultaneously launched new invasions of provinces to the south of Sanaa, in an effort to bring larger sections of the country under the direct control of their new regime. This has been accompanied by reports of the seizure of a major government military installation, manned by some 2,000 troops, by Sunni militants affiliated with AQAP. Comments from US officials late this week suggested that the US ruling elite is preparing to respond to the breakup of the Yemeni state with a new military escalation, ostensibly directed at combatting AQAP, but aimed more broadly at asserting control over the geostrategically key country. The family of Rachel Corrie—the 23-year-old U.S. activist crushed to death by an Israeli military bulldozer while nonviolently protesting a home demolition in Palestine 12 years ago—was denied justice by Israel’s top court on Thursday. The rejection is the latest stage in the family’s decade-long legal battle to hold Israel liable for Corrie’s death, on charges that the military either killed her deliberately or was negligent. Corrie, who hailed from Olympia, Washington, had been volunteering with the International Solidarity Movement for two months in Gaza when she was run over and killed by Israeli forces near the Rafah crossing in 2003. Her death sparked international outrage at Israeli human rights abuses, as well as accolades for Corrie’s life and legacy. Since her killing, Corrie’s parents—Cindy and Craig—have continued their daughter’s work for global justice. However, they have so far not seen justice in Israel’s courts. This dismissal garnered widespread condemnation, including from U.S. Ambassador to Israel Dan Shapiro, who slammed the probe into the killing of Corrie as unsatisfactory. On Thursday, Israel’s supreme court rejected the Corrie family’s appeal of the 2012 ruling. The court has determined, however, that a separate case filed by Corrie’s family, which charges that her remains and autopsy were mishandled, may proceed through a lower court. At least 844 Palestinians were killed as a result of airstrikes on homes during Israel’s summer attack on Gaza, an Associated Press exclusive analysis has revealed. The review published Friday found that 508 of the dead—just over 60 percent—were children, women, and older men, all presumed to be civilians. “Hamas says it did not use women as fighters in the war, and an Israel-based research group tracking militants among the dead said it has no evidence women participated in combat,” AP notes. – Children younger than 16 made up one-third of the total: 280 killed, including 19 babies and 108 preschoolers between the ages of 1 and 5. – In 83 strikes, three or more members of one family died. – Among those killed were 96 confirmed or suspected militants—or just over 11 percent of the total—though the actual number could be higher since armed groups have not released detailed casualty lists. – The remainder of the 240 dead were males between the ages of 16 and 59 whose names did not appear in connection with militant groups on searches of websites or on street posters honoring fighters. “Either they have the worst army in the world that constantly misses targets and hits civilians, or they are deliberately killing civilians,” Hanan Ashrawi, a Palestinian spokeswoman, told the AP. If most of those killed are civilians, “you cannot call them collateral damage,” she said. The results of the AP count, which looked at 247 airstrikes on homes, come on the heels of similar findings released at the end of January by Israeli human rights group B’Tselem. That report pointed to three factors behind the high numbers of Palestinian civilian casualties in the more than 70 incidents they investigated: Israeli forces’ overly broad definitions of legitimate military targets, their repeated violations of the “principle of proportionality,” and a lack of or ineffective warnings to civilians that the homes would be targeted. The United Nations reports that in all, 2,205 Palestinians died during Israel’s Operation Protective Edge, including at least 1,483 civilians of which more than 500 were children. The 2014 conflict also resulted in the deaths of 67 Israeli soldiers and 5 Israeli citizens. President Obama hasn’t gotten approval for his “intentionally vague” Authorization for the Use of Military Force (AUMF) against ISIS, but the Pentagon is already scrambling to escalate its military presence in the region in preparation of the ground war it would start. Over 4,000 ground combat troops from Fort Carson’s 3rd Brigade are being sent to Kuwait under this new deployment, where they will make up the region’s largest collection of US ground troops, which will include heavy armored vehicles. Even as President Obama continues to deny plans for a ground war, it’s not a secret what the troops are being sent to Kuwait for, and officials say they’re prepared for “any contingency,” which in this context means a fight with ISIS. The US has scattered its current ground contingent in Iraq across several different areas, with the 320 ground troops deployed as “trainers” in the Anbar Province now on the front lines of the Iraq-ISIS war. ISIS fires intermittently at their base, and it seems only a matter of time before they’re in direct combat. Which is where the “over 4,000″ troops from Fort Carson come in. Unlike the putative trainers being sent, these include not only infantry but a whole brigade with the large amount of armored units. There’s not even the pretense that these guys aren’t being sent for a very heavy ground war. Whatever enduring means, the troops from Fort Carson are about to find out, and officials are either waiting for the AUMF or some ready-made emergency with the Anbar troops to launch the ground war. The son-in-law of a comrade I know is facing deportation to the U.S. by the Harper Conservatives where he could spend the rest of his natural life in a US military prison for opposing and exposing war crimes in Iraq. Please read, share, and support their appeal. We understand from Mr. Toet MP’s office that you chair the Conservative Party MP Manitoba caucus. 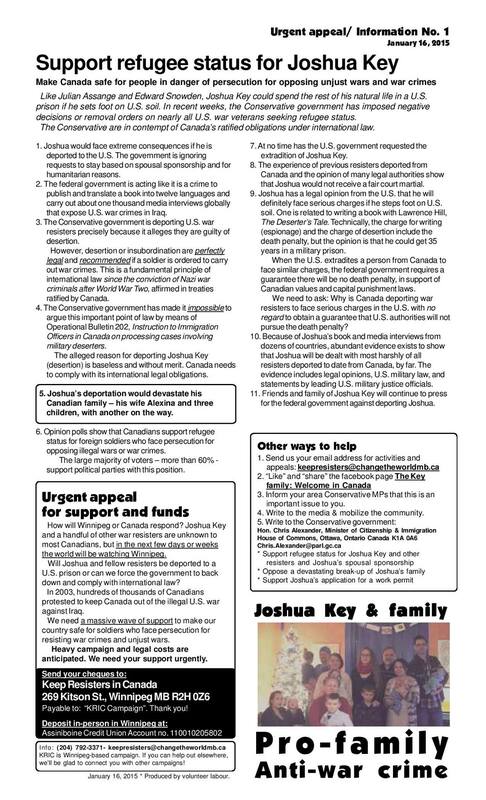 Urgently, we request your caucus consider the matter of our son-in-law Joshua Key’s probable imminent deportation to the United States where he would likely spend 35 years in a U.S. military prison. We are attaching a newsletter produced by family and friends that provides more background. We want to emphasize that deporting Joshua to certain incarceration for the rest of his natural life would be a devastating blow to our family. His children are too young to realize the gravity of the situation, but the older family members have a firm grasp of the issue. We know Joshua is not a criminal. He is a kind, loving and caring person who acted correctly and according to international law when he deserted the U.S. military after serving in Iraq in 2003. He wrote about the war crimes he witnessed in The Deserter’s Tale, written with Lawrence Hill (2007). At times, desertion is perfectly legal and highly recommended. It was the Nazi war criminals who displayed exceedingly bad judgment. Your government is making the same mistake 67 years later. Tearing Joshua from his family to face extreme persecution in the United States does have consequences beyond his personal fate. It would create a giant stain on Canada’s reputation as a country that opposes war crimes. Among our allies, it would create a political climate where soldiers are afraid to oppose or expose war crimes. And it would enable war criminals at high levels of command, rather than discourage them. To be clear, this is not a matter of sudden conscientious objection to military service, but of refusal to commit war crimes or continue in a situation where officers condone or order torture and other war crimes and are not punished. One of your colleagues, Mr. Jason Kenney, called Joshua and like-minded veterans “bogus refugee claimants.” In our view, this is a canard and prejudicial commentary on what should be a legal matter. Not only is “criminal” another canard, the bulletin precludes Joshua from providing evidence at the tribunal level of his well-founded fear of persecution if he steps foot on U.S. soil and his legitimate right to refugee protection. The rule of law no longer applies to Joshua and other U.S. military veterans seeking refugee status. Their status is at the mercy of the minister and in flagrant violation of our ratified obligations under international refugee law. As demonstrated in the case of a removal order against another U.S. veteran in November, the minister may now deny our daughter Alexina’s application for spousal sponsorship and deport Joshua. Joshua and Alexina have complied with all the sponsorship’s requirements. For the status determination of deserters, it is important to recall that those who commit war crimes, crimes against humanity or serious non-political crimes may be excluded from refugee status as not deserving of international protection, even though they may otherwise have a well-founded fear of being persecuted for one of the Convention reasons. Canada’s obligation under international law is to protect soldiers who do not want to commit war crimes and who have a reasonable fear of persecution in their home country. 3. Allow the full scope of international law to apply to refugee applicants regardless of country of origin. In our family’s view, Joshua must not serve 35 years in a military prison for refusing to commit war crimes (desertion) and exposing them (he will likely be charged with espionage, but not Lawrence Hill). In closing, we want to say that we are grateful to have met Ms. Joyce Bateman, MP on January 21. She was the only Conservative MP who agreed to meet with us and listen to our concerns. If you have questions, she will be helpful. Our MP, Shelly Glover (St. Boniface), has not provided a date since asked in December. We may be reached at (204) 792-3371 or by email with your response. 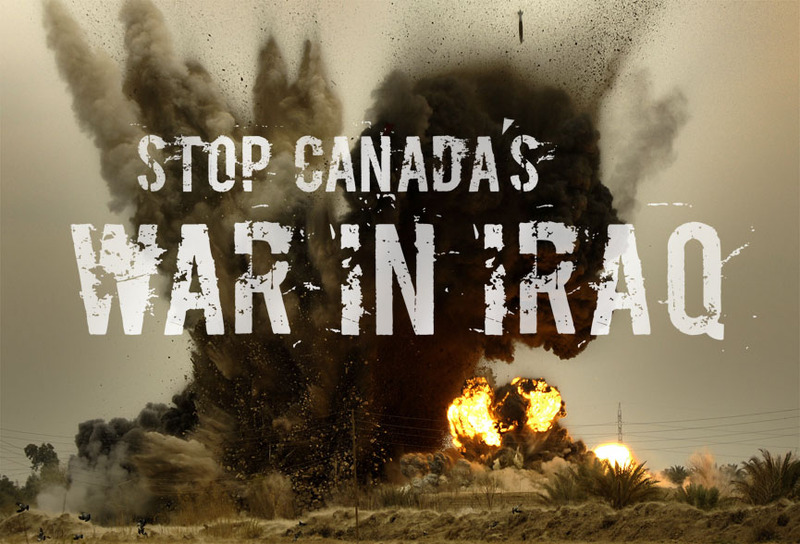 Stop Canada’s War in Iraq! Prosecutors at the Hague-based International Criminal Court (ICC) will open a preliminary inquiry into possible war crimes in the Palestinian territories, the first formal step that could lead to charges against officials there and in Israel, the court has said. They will determine whether preliminary findings merit a full investigation into alleged atrocities, which could result in charges against individuals on either the Israeli or Palestinian side. “A preliminary examination is not an investigation but a process of examining the information available in order to reach a fully informed determination on whether there is a reasonable basis to proceed with an investigation pursuant to the criteria established by the Rome Statute,” the court’s statement said on Friday.